John Deere’s new EZ Ballast Wheel System provides a versatile ballasting solution for tractors, without blocking the front and rear hitches. 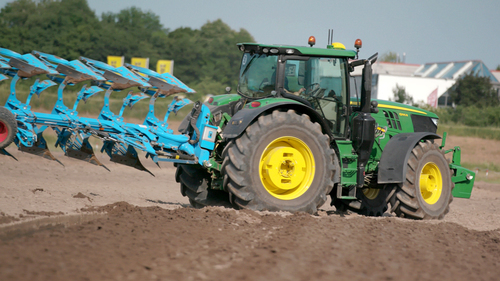 The system’s flexible weight distribution is designed to ensure higher traction and lower soil compaction in the field. Flexible ballasting for different applications often fails in terms of the time and effort required. The EZ Ballast Wheel System enables operators to change the front and rear wheel weights very quickly without the need for additional tools. It takes just five minutes per wheel to add or remove the weights, and a second person is not required. Each front wheel can be equipped with one 250kg weight, while the rear wheels can be fitted with two 250kg weights, which means a total of up to 1.5 tonnes can be added and removed. Depending on the front and rear mounted implement combination, the operator is able to adjust the overall weight and weight distribution easily, without impeding the front and rear lift capacities. This is supported by the John Deere Ballast Assist system running on the tractor’s CommandCenter display. After the necessary front and rear implements have been selected, the system recommends the most suitable weight distribution and relevant wheel weights. On the road the EZ Ballast Wheel System allows operators to avoid unnecessary weight on the tractor and reduce fuel costs by up to three per cent. Moreover, a lower overall tractor weight allows an increase in the trailer payload, so transport capacity can be boosted by up to nine per cent.